Once upon a time, attraction passes—those that include entry into a series of attractions in a destination— were rare novelties reserved for a few major cities. Not anymore. Now they’re popping up everywhere, both in the U.S. and elsewhere, and often include activities in addition to attractions. Here’s the scoop on two new cards, plus some information on a discount card for activities and more in Seattle. GoBlueRidge Card: This card covers rafting, cavern tours, tubing, gem mining, and more activities. Prices start at $79 for adults or $49 for kids 12 and under. GoMaui Card: The GoMaui Card includes whale watching, snorkeling, kayaking, surfing lessons, sailing. Prices start at $269 for adults or $205 for kids 12 and under. 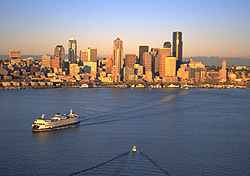 Seattle Tour Saver: Offers two-for-one deals on tours, cruises, accommodations, and activities in and around Seattle. The pass costs $80. The rule of thumb for attractions cards is to decide which of the included options you’re likely to visit, and then compare á la carte pricing against the cost of the card. And, especially with the cards listed above, be aware that some of the activities offered are seasonal (for example whale watching and tubing).